Kirklees Priory was a Cistercian nunnery which occupied the site of the present-day Kirklees Park, at Clifton near Brighouse in West Yorkshire, the private 750-acre estate, lies between the M62 and Wakefield Road . The priory, which was dedicated to the Virgin Mary and St James was founded by Reiner le Fleming, Lord of the manor of Wath upon Dearne, in 1155 during the reign of King Henry II. Between 1306 and 1315, nuns from the priory became involved in scandals, the Archbishop of York wrote to the prioress about rumours concerning Alice Raggid, Elizabeth Hopton, and Joan Heton, these rumours implied they had been seeing religious and secular men in the nunnery and their behaviour led to the house being considered one of disrepute. The priory was not dissolved by the Dissolution of the Lesser Monasteries Act in 1535, but continued for worship and hospitality. In 1539, following the Second Act of Dissolution, Joan Kyppes surrendered the priory, which had eight inmates at the time. At the date of surrender the whole property was worth £29 18s. 9d. The site was then granted to John Tasburgh and Nicholas Savill and the church and priory buildings demolished and the stone used to build Low Hall now known as Old Farm. The Kirklees Estate passed to the Armytage family and remained in their possession until the death of Lady Margarete Armytage in 2008. It was developed in the late eighteenth century, to the design of Richard Woods for Sir George Armytage, 3rd baronet. The site was developed subsequently, especially in the early twentieth century by Sir George Armytage, 6th baronet. A local inn, The Three Nuns was named after Cecilia Topclife, Joan Leverthorpe, and Katherine Grace who sought refuge at the site of a guest house of the priory and ran it as a hostelry. The present inn was built in 1939 and the site of the guest house is buried under the car park. 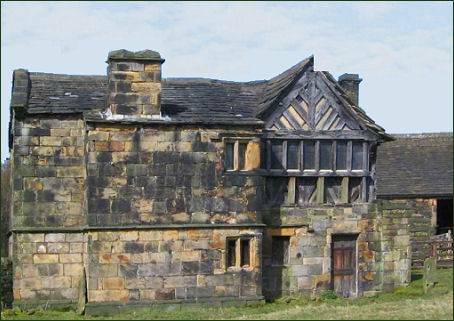 All that now remains of Kirklees Priory are the long double aisled barn, parts of Old Farm House, calf house and the gatehouse (pictured above right). All Grade I listed buildings. The priory is connected with the medieval legend of Robin Hood, England's outlaw hero. The upper room of the gatehouse is where the legendary Robin Hood is said to have breathed his last, it is approached by an outside staircase and there are interesting ornamental foliated work carved into the beams which include an appropriate hunting scene with stag and hound. 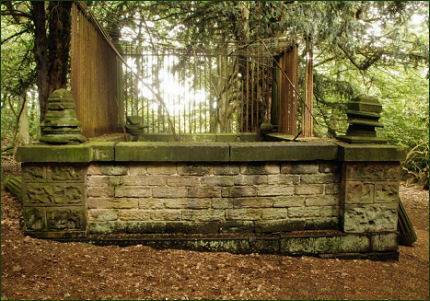 A monument in the woods near the River Calder claims to be Robin Hood's grave. He was traditionally supposed to have been bled to death by the prioress of Kirklees. In the "Lytell Geste of Robyn Hode" the earliest surviving ballad about Robin Hood, the prioress is referred to as "The Pryoresse of Kyrkely". The identity of the prioress is the subject of much debate as indeed is the date of Robin Hood's death. Legend relates that Robin, who was unwell, decides to be bled by his kinswoman, the prioress of Kirklees, a woman "skilled in physic." Robin sets out on the journey accompanied by his faithful comrade in arms, Little John. On their arrival at the nunnery, the prioress takes Robin into the gatehouse and sends Little John away. She then proceeds to bleed Robin accompanied by her lover, the convent priest Red Roger of Doncaster. Realising he is being bled to death, Robin summons Little John to his assistance by blowing three blasts on his hunting horn. 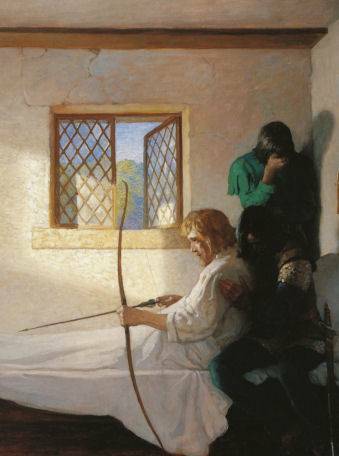 When Little John arrives it is too late to save Robin, but he helps him fire his last arrow from the gatehouse window, promising Robin that he will bury him where it falls. The supposed site of Robin's grave, lies 60 yards from the gatehouse, considered to be an improbable arrow shot for a dying man, is, today, neglected and overgrown and enclosed in rusted, twisted iron railings, erected in Victorian times. However, many dispute the accuracy of the claim. According to Richard Rutherford-Moore, a local history enthuiast, the bones were dug up in the eighteenth century, the whereabouts of these bones is unknown.. The earliest reference to the gravestone is in Philemon Holland's English translation of William Camden's Britannia (1610). In the eighteenth century, Thomas Gale, Dean of York, claimed to have found a poetic epitaph with the date of death given as 8 November 1247, which is the date in the modern calendar that corresponds to 24 Dekembris in the calendar in use in 1247. The language in which it is written is not classified as the received Middle English of the time, but English was then, as it is now, a language with great diversity and many dialects. The grave was restored in 1850. Obiit 24 kal: Dekembris, 1247. After an investigation was conducted with the aid of Ground Penetrating Radar, done by the crew of the tv programme Expedition Unknown, it was found that there were no indication of a ground disturbance to indicate a burial. Also, no evidence of a body was found by using the Ground Penetrating Radar at this site. In 1784 Captain James Shuttleworth exhumed the grave to find the bones of a man over seven feet tall.